The new lane extends from 3rd Ave. SE to the northbound I-5 on-ramp. 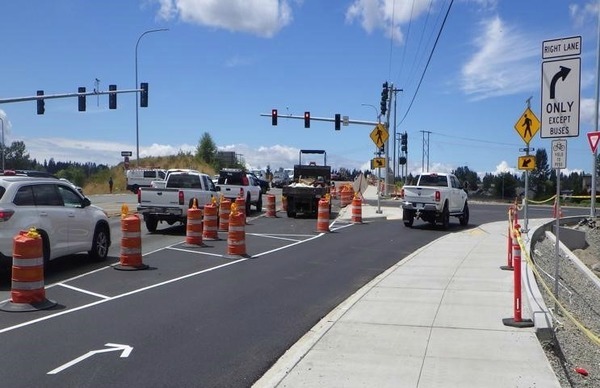 New Lane Opens on Westbound 128th St.
A new right-turn/transit lane has opened at the I-5 overpass heading westbound on 128th Street SW, a well-known congestion point. The road-widening project is part of Community Transit's Swift Green Line bus rapid transit project that began construction last summer. Previously, westbound 128th St. had two lanes: one for through traffic across the overpass and another for both through traffic and vehicles turning right onto the northbound I-5 on-ramp. Now there are three lanes: two for through traffic and a new one that allows buses to get onto the overpass while other vehicles can make a right-turn directly onto the on-ramp. The new lane, which begins at 3rd Ave. SE, is open and available to all traffic. The bus-only feature will open in mid-August after WSDOT has completed a repaving project in the area. At the traffic signal, buses in the new lane will get a special "queue jump" green light several seconds before other vehicles, allowing the bus to move ahead. A similar bus-only lane opened on the other side of the I-5 overpass in January. The opening of the new lane indicates the near-completion of the 128th St.
road-widening project for Community Transit's Swift Green Line. Crews will be on 128th St. over the next several weeks to install fencing, landscaping and traffic signs, but no lane closures are anticipated. Information about the 128th St. project is online at www.communitytransit.org/128th. Don't miss the next Community Transit Live on Monday, July 16 at noon! Rumor has it that a very special guest will talk about what it's REALLY like to drive a bus. Join us on Monday on our Community Transit Facebook page. Bring your lunch and your questions about Swift construction, bus rapid transit, or anything else related to our service. 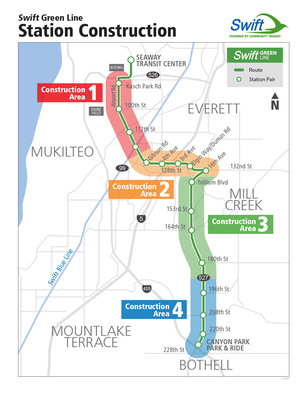 The Swift Blue Line stations on Evergreen Way at Pecks Dr. and 4th Ave. W are closed for repainting through July 18. These are the last two stations of the first phase of the repainting project. Crews will not immediately close two more stations for painting; instead, they will take time to prepare the next ten stations for painting by pressure washing them during non-service hours. The second phase of the repainting project will begin on Monday, July 30, with the closure of two stations on Hwy. 99: at Airport Rd. and at 148th St. SW.
Why are stations being painted? The Swift Blue Line stations have been in service since 2009, and they are ready for a new coat of paint! The new paint is specially formulated to last 15 years. How do I ride Swift when my station is closed? Stations will close for about a week to be repainted. If your station is closed, there will be signs directing you to a nearby Everett Transit bus stop. Simply board Swift there, and pay your fare when you de-board. More information about the painting project can be found at www.communitytransit.org/SwiftPaint. 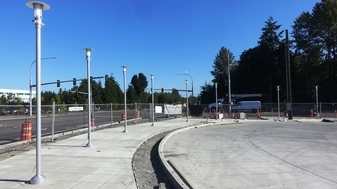 Light fixtures have been installed along the perimeter of the future Seaway Transit Center. Although they won't have power for several weeks yet, they are the latest visible indication that the transit center is nearing completion. During the week of July 16-20, intermittent lane closures are expected on 75th St. to allow crews to remove the temporary traffic poles from the intersection with PUD and the transit center. Lane closures will occur as needed, and may include one lane in each direction. Look for us at the Mill Creek Festival this weekend! Community Transit planners and outreach staff will be on hand to talk about Swift Green Line and how to use it. Please stop by to say hello and learn about bus rapid transit in south Snohomish County. Station construction for the week of July 16-20 is scheduled as follows. The southbound station at 196th St. is the only one scheduled for work next week. Crews will focus first on installing a drainage system, then on electrical systems for the future station. Southbound, Bothell-Everett Hwy. and 208th St.
Drainage and electrical. One southbound lane closed as needed. Retaining wall. One northbound lane closed as needed. Sewer. One southbound lane closed as needed. 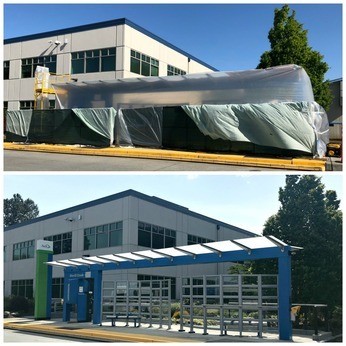 Three stations in Areas 1 and 2 are scheduled to have the structure canopy installed next week. No lane closures are required for this work. Eastbound, 128th St. and 4th Ave.
Northbound, Airport Rd. and Gibson Rd. Swift Network News provides the most up-to-date construction information available at the time of publication, but schedules are subject to change at any time.